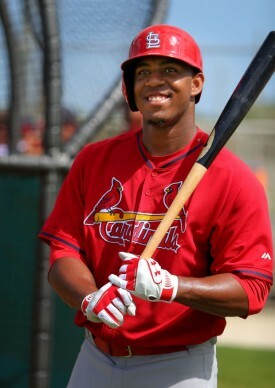 Absolutely heartbreaking news tonight: Oscar Taveras was killed in a car accident in the Dominican Republic. The Cardinals were hit with devastating news on Sunday, when it was learned that top prospect Oscar Taveras was killed in a car accident back home in the Dominican Republic. Taveras’ agent, Brian Mejia, confirmed the news to MLB.com. Reached by phone, general manager John Mozeliak said that he, too, had heard from Mejia, but that the organization was waiting for a few more details before confirming the news with a public statement. Such a tragedy. Sincere sympathies to Oscar’s family, friends, teammates and everyone with the Cardinals. The St. Louis Cardinals offer condolences to the family of Oscar Taveras the 22-year-old Cardinals outfielder, who was killed earlier today in an automobile accident in the Dominican Republic. The team will provide additional information on funeral arrangements at a later time. This entry was posted in 2014 Cardinals and tagged Oscar Taveras by Christine Coleman. Bookmark the permalink.